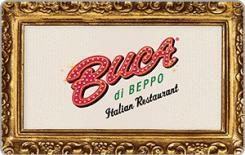 Earn 7.2 SB per $ when you buy Buca di Bepppo gift cards at MyGiftCardsPlus, powered by Swagbucks. The special monthly discount of 12% for this prize will be available to you again next month. Buca di Beppo offers modern Italian cuisine in an eclectic, vintage setting. Bucaâ€™s family-style dishes are available in two portion sizes. Buca Small feeds up to three and Buca Large feeds an average-sized country. Well, actually it feeds up to six. With over 80 locations nationwide, Buca di Beppo is the perfect place for celebrating a special occasion, planning a business dinner or having a night out with family and friends.